SHISEIDO BENEFIANCE WrinkleResist24 Night Cream 50ml is an age-defying night time moisturizer that intensively addresses lines and wrinkles before they become more serious. Offering visible reduction in the appearance of wrinkles, and helping promote silky smooth skin condition while encouraging recovery by morning Promotes smoothness to the skin instantly. The SHISEIDO BENEFIANCE WrinkleResist24 Night Cream provides a dramatic effect in the diminishing appearance of wrinkles and fine lines. SHISEIDO BENEFIANCE WrinkleResist24 Night Cream 50ml was found on 3 websites and was price compared using EAN: 0729238103092. 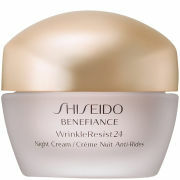 The cheapest SHISEIDO BENEFIANCE WrinkleResist24 Night Cream 50ml is shown as the main item, prices range from £0 to £71.00, excluding delivery. Price comparison based on price and delivery charges, with any valid discount codes being applied, is shown in the table above. Prices and information correct at the time of publication.